With April coming to a close, it’s means it’s time to wrap up my 5th Scrap-i-versary Celebration. 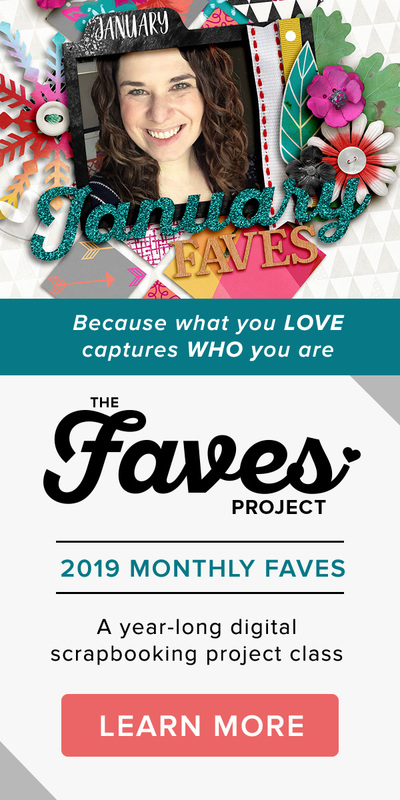 So far this month I’ve told the story of how my digital scrapbooking journey began, shared my FAVE digital scrapbooking project ever, revisited some of my scrapbooking hits and cringe-worthy misses and counted down the last 5 years of digiscrapping. To close out my 5th Scrap-i-versary Celebration, it seems only fitting that for my 5th and final Scrap-i-versary post, we leave behind the days of scrapbooking past and turn our attention toward the future. Revisiting some of my favorite and least favorite layouts and projects during this month made me realize there were a few changes I would like to make around here. 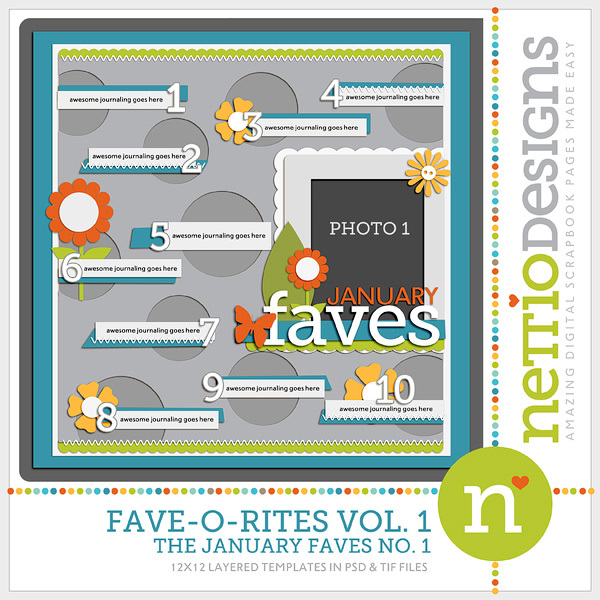 As I mentioned in my hits & misses post earlier this week, back when I first started digital scrapbooking, I scrapped both square (12×12 or 8×8 really) and rectangle (8.5×11 layouts) and regularly swapped between a more paper-esque scrapbooking style and a more graphic magazine style. Over the last several years I’ve really gotten away from this but I would love to get back into the habit of mixing things up, keep things fresh and stepping outside my scrapbooking comfort zone more often. Expect to see a wider variety of page sizes (maybe even a pocket page protector or two), as well as styles, and maybe even a paper or hybrid project thrown here and there too for good measure. One of mine and Adam’s absolute favorite things to do is travel. As Adam will be the first to tell you, if you ask me what I want to do over the weekend, my answer 9 times out of 10 will be “I just want to GO somewhere!” We love visiting new places and seeing new sights. It’s one of our favorite things about the military lifestyle. But if you were to look through my scrapbook albums would you likely know this about us? Nope. In the five years since I started digital scrapbooking, we have lived in Korea for a year, taken trips to amazing places like Japan and Hawaii, and taken our first ever trip to Disneyworld and soon, NYC. We’ve gone on numerous road trips and camping trips and explored some awesome places like Yellowstone and Carlsbad Caverns. But how many of these trips would you actually see if you flipped through our scrapbooks? Sure there may be a page here or there but for the most part, these memories and photos remain safely hidden away in our minds…and the depths of my computer hard drive. So goal number 2 for this year is to get my travel scrapbooking on and actually document some of these amazing trips we’ve been lucky enough to take over the years. By far the biggest obstacle holding me back from scrapbooking our travels is the sheer number of photos. Coming back from a trip with 800-1000 RAW photos to sort through is a daunting task! If I’m going to embrace travel scrapbooking this year, I really need a photo and scrapbooking system that can handle the large volume of photos I’ll have to deal with. The Great Computer Spring Clean-a-thon was a great start but there is definitely still a lot to do when it comes to getting my organizing system into tip-top shape. So expect to see lots more posts about my adventures in organizing (and mis-adventures, I’m sure, haha) here on the blog. I am determined that this year will be the year I find a systems that WORKS. Now I’m sure there are some of you who would find the idea of 100 layouts in a year laughable. You probably scrap that many layouts in a month with a baby in your arms and two toddlers running around. Ha. The truth is in the five years I’ve been digital scrapbooking, the most number of layouts I’ve ever done in a single year has been 85. Which means 100? Kind of a bold goal for me. By the end of April I will have completed 15 layouts (that’s an average of 3.75 a month for you fellow math nerds out there) which means I’ll have 8 months left to scrap 85 layouts. Averaging 10.6 layouts a month. Eeek. My CT requirements with make up a minimum of 32 of those 85 but that still means I have at least 53 layouts to scrap on my own. 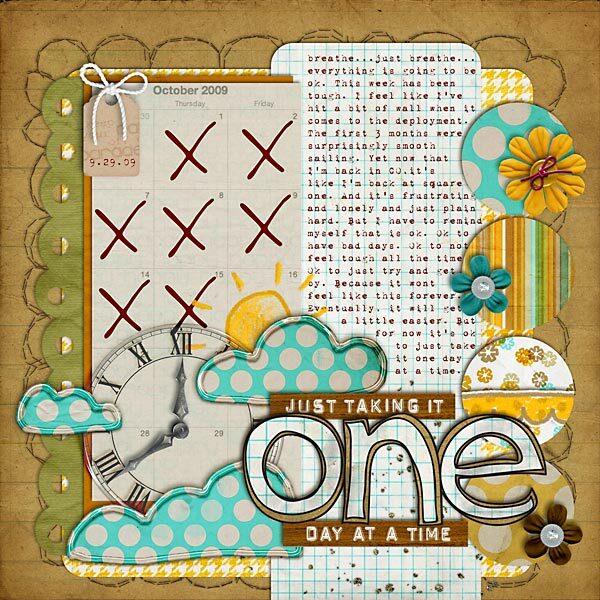 It’s going to be a challenge for me I know, but I am excited for the prospect of getting back into a more consistent scrapbooking rhythm again and taking time to scrap layouts that are just for me. 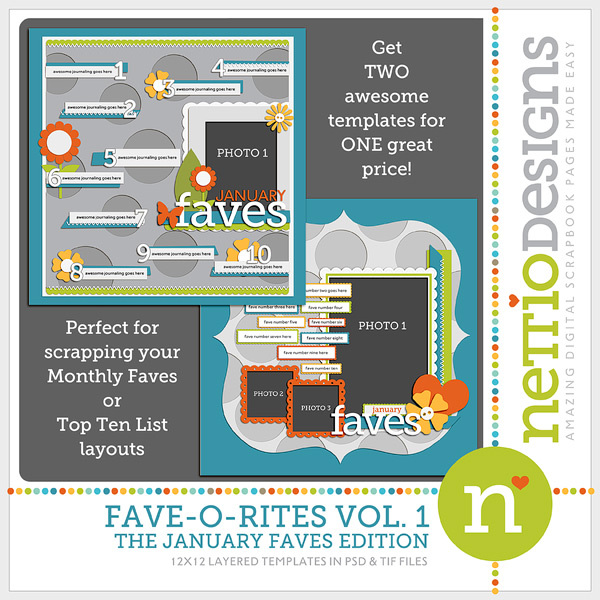 Plus more layouts from me = more template-y goodness for you. It’s a win-win, haha. Yep, that’s right, I am putting this out here. For all to see. Haha. 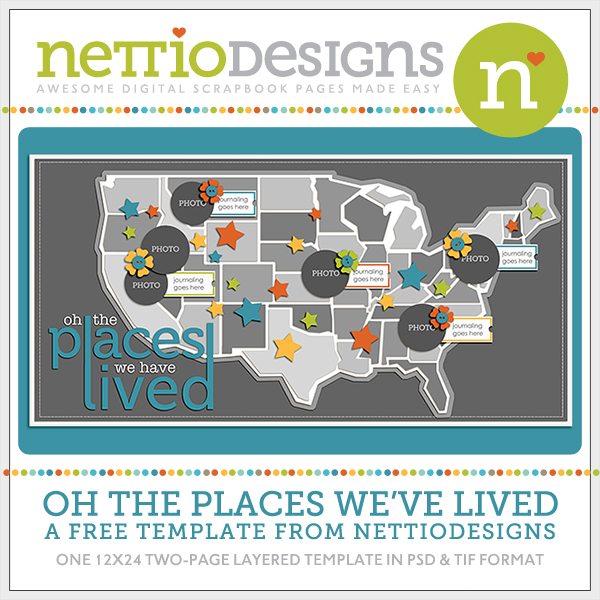 When I started NettioDesigns back in February, I knew it was going to be a learning experience. Just how BIG of a learning experience I don’t think I realized. Haha. So things around here definitely got off to a slower start than I would have liked as a I slowly learned how to balance scrapbooking, a digi website and life. But with three months under my belt I am definitely getting into a groove and I’m ready to start ramping things up around here. Time to take some of these plans and turn them into action. More templates. More scrapbooking adventures. More tips. More tricks. More tutorials. You name it. 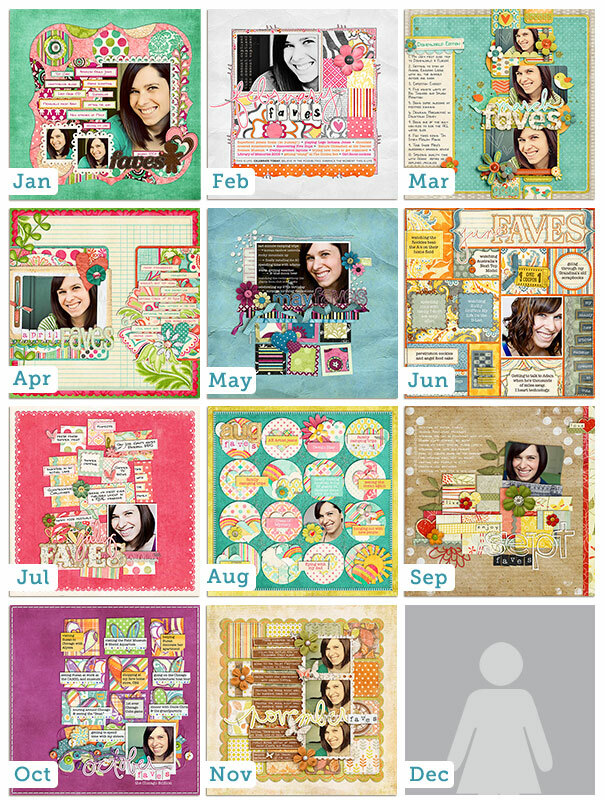 What do you struggle with when it comes to digital scrapbooking? Whatever it may be, big or small, easy or hard, I want to hear about it. 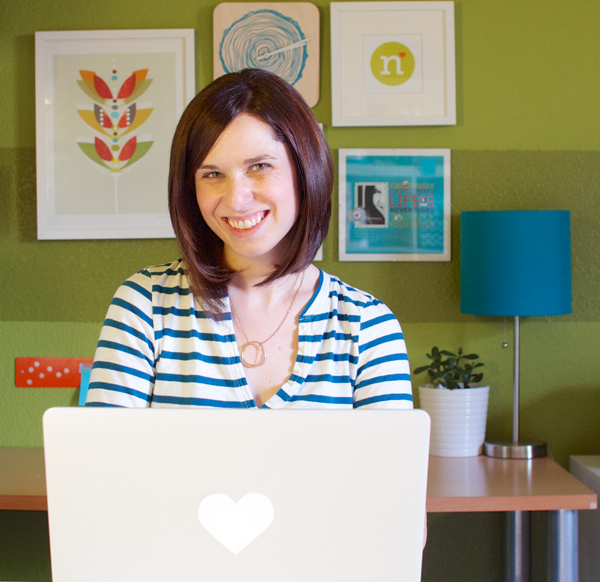 Now is the time to ask your burning scrapbooking questions. Have an awesome idea for a template, a tutorial you’d love to see? Feel free to share that too. 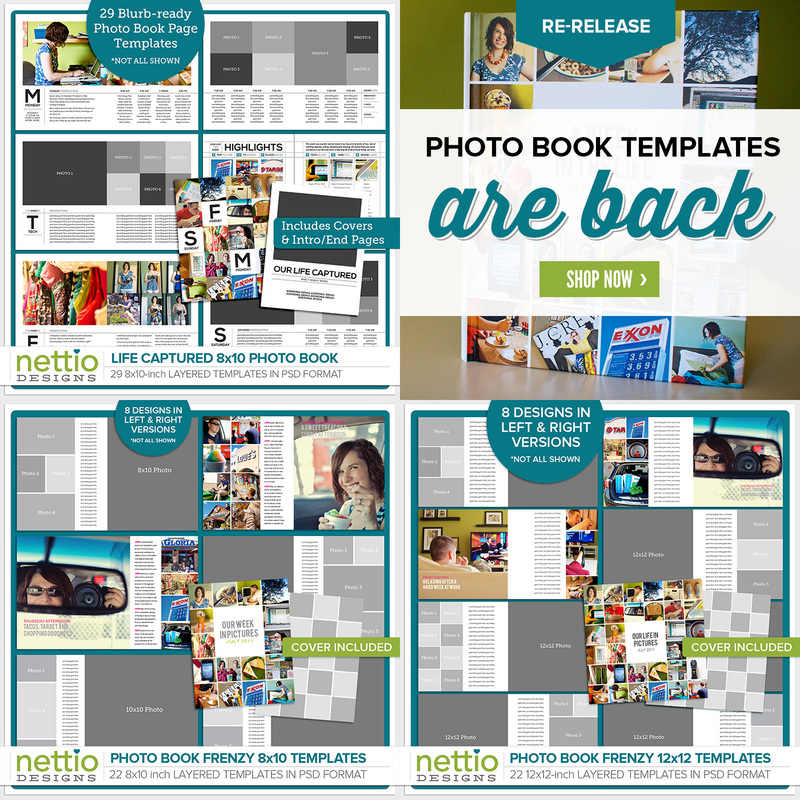 Now is your chance to get those burning digital scrapbooking questions answered. And just for a little added incentive…how about a giveaway. One lucky commenter will win my next template release for FREE. I know you like free. 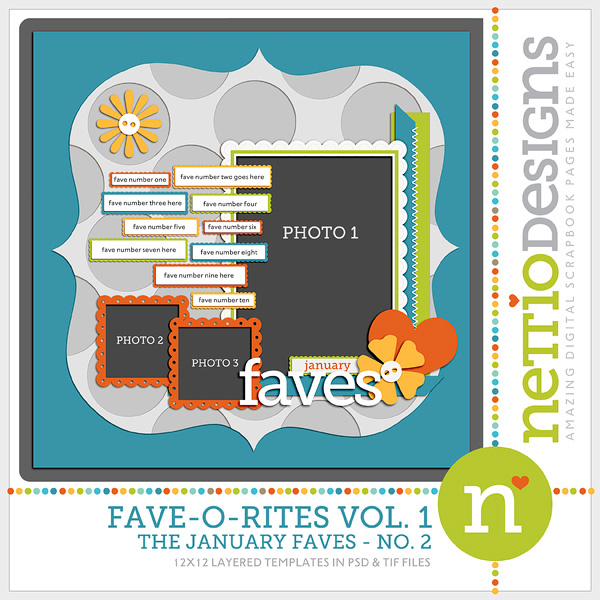 To enter, all you need to do is leave a comment here on this blog post letting me know what you’re struggling with (or what you wish you could do better) and what you would love to see here at NettioDesigns when it comes to digital scrapbooking. Want to increase your chances of winning? Post about this giveaway on Twitter and encourage your digiscrappy friends to come give their input too. Link me up to your tweet in a separate new comment to earn an extra entry. You’ve got until Tuesday, May 3rd, 7am EST to post your comment to be eligible to win. Winner will be announced on the day of the new release. And with that, my 5th Scrap-i-versary Celebration comes to an end. It’s been a fun five scraptastic years so far and I’m so thrilled with all the memories I have scrapped but I am definitely excited to see what the next few years bring scrapbooking-wise. Should be a fun! Psst…want to make sure you don’t miss out on any of my future scrapbooking adventures? You should sign up for my blog RSS feed here. There we go, that’s better. Take it away, Count von Count! So there you have it. Five years of scrapbooking fun broken down for some mathtastic nerdiness. Anything I missed that you must know? Ask and i shall calculate…using my handy dandy calculator, that is, haha. 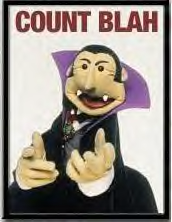 Count Blah photo found here. 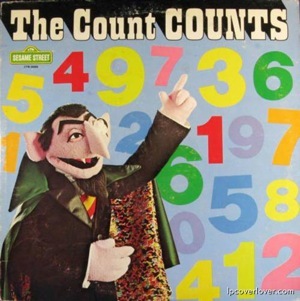 The Count photo found here. Since I shared a little bit about one of my favorite scrapbooking projects in my last 5th Scrap-i-versary Celebration post, I thought today would be a good time to share some of my scrapbooking hits and misses over the past 5 years. Think of it as an Oscar Best & Worst Dressed list but with less designer duds and more scrapbooky goodness. And no Joan Rivers. When I look through my folders of digi layouts of yore, one thing that really strikes me from my early days is the amount of design variety in my layouts. Back then not only did I scrap both 12×12 and 8.5×11 layouts but I regularly switched between a more paper scrapbooking style and a more graphic magazine style. Over the years, I’ve moved away from this in favor of more paper-centric CT friendly layouts and while I don’t really regret it, I do miss stepping outside my regular style comfort zone more often. It’s good for my creativity and it pushes me to see things in a different light. Plus I love seeing the variety of sizes and styles in my albums. This is one relic from my early scrap years that I would definitely like to revisit more today. …because they are 100% me. And yes, that is me pretending to eat an entire block of cheese. Haha. 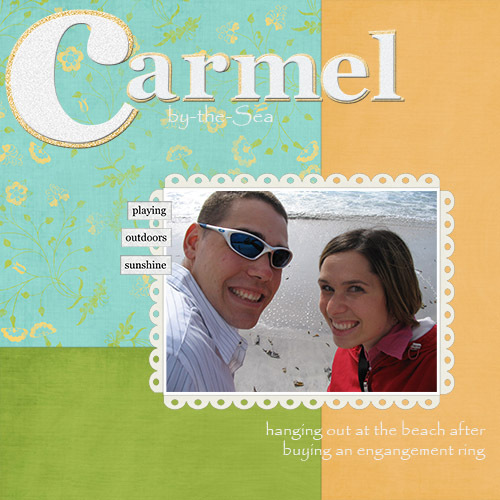 One thing I am forever grateful for when it comes to my scrapbooking is that I never got caught up into the whole idea of being, well, “caught up.” No having to scrap every photo in chronological order for this girl. I am all about keeping things low stress. Perhaps this is a benefit of being a child-free scrapper and not having a constant reminder of just how fast my children are growing up, but I love having the freedom to scrap what I love most. I scrap the stories that matter most to me when they matter to me and I think there’s something incredibly magical about that. I LOVE looking back and seeing all these little bits and pieces of my life that I would have otherwise forgotten. My albums are essentially journals of my life during the past five years and I think that is oh-so-cool. What makes this page especially cringe-worthy for me is the simple fact that that photo? Not taken in Spring. In fact the photo itself has absolutely nothing to do with spring. That photo was taken in August right before Adam deployed to Iraq. It was a last little hurrah just days before Adam deployed and was also our first trip to Rocky Mountain National Park (which is an AMAZING place by the way). We had gotten up early all eager-beaver style to take a hike up to this lake with the plan being to arrive there just in time to have lunch. We’d even packed a lunch and everything! But apparently we were either in much better shape than we thought or the hike was just that easy because we managed to arrive at our destination lake by 10am. Oops. So instead we had a snack, hung out for a little bit and went back to our campsite for lunch.It ended up being a really nice, relaxing day. But you won’t find that story above on this page. Why? Because I clearly felt it was more important to include some sweet springtime wordart that had nothing to do with the story. And that’s definitely a scrapbooking FAIL in my book. Aww, the Digi Dares. For three years I was a member of the The Digi Dares, a challenge blog where we posted weekly challenges designed to push you out of your creative zone both design and topic-wise. Let me just say this, joining the Digi Dares was one of the best scrapbooking decisions I’ve ever made during my five years of scrapbooking. Not only did the Dares keep me scrapping on a regular basis but they forced me to think creatively, try new-to-me styles and scrap stories I wouldn’t have otherwise. When I look back at my three years of Digi Dare layouts, there is something oh-so-magical about them. Some of my most favorite layouts ever are from my Darer days. When I stepped down from the Digi Dare team in December 2010, I knew it was the right decision. With Adam being deployed, my scrap mojo was at an all time low and well, after three years, I had gotten a bit burnt out. But there are definitely days when I really miss the Digi Dare experience. There’s no denying that the Dares helped me become the scrapbooker I am today. My time as a Darer is definitely a part of my scrapbooking journey I will forever look fondly on. 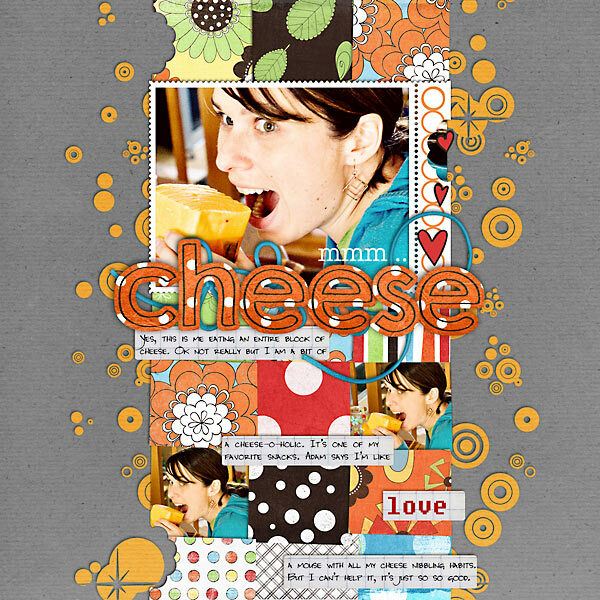 Back when I first started digital scrapbooking, the “in” design style at the time was all about angles. Take a single photo, angle it a few degrees, slap a few elements on it and call it good. I remember one very popular scrapper at the time talking about how she would purposely angle an element by 12 degrees to the left on one side of her page and then balance it by adding that same angle going to the right to an element on the opposite side of the page. These were amazing times, folks. Coming from a much more linear design background (it doesn’t get much more linear than newspaper design, haha), angles were SO not my thing. I can appreciate a well placed slightly tilted element but angles in an attempt to make things interesting with no real purpose makes me twitchy. For the first two years of my scrapping career, I tried to make it work. Really I did. And I hated those pages. They were so.not.me. The moment I realized all my favorite scrapbookers were ones who had a much more clean, symmetrical, linear style was the moment I started to find my own style and really create consistently pages I loved. Realizing that it was OK to focus on what I loved rather than what was in at that moment was a huge lightbulb moment for me for sure. 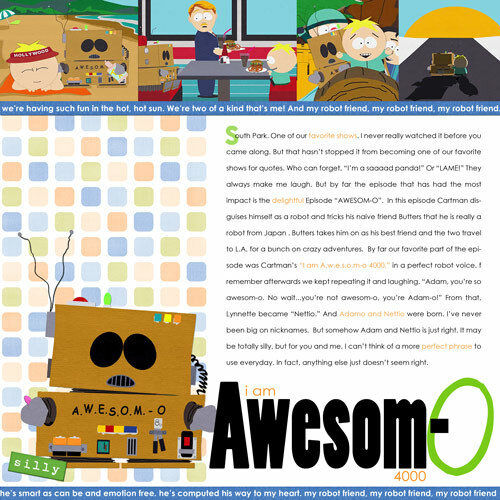 Which really, how can you not love a layout featuring Awesom-O? The fact that it tells the story of how the name Nettio was born is just icing on the cake. But pages like the Golden Light layout above make my eyes bug out. I just want to reach out and deangle-fy everything. Kinda like needing to adjust a picture frame that’s just sliiiightly not level. Haha. What’s more surprising than the fact that I still actually like this layout today, is the fact that I managed to make it through the first cut of the competition and into the top 100. As a newbie scrapper, this was HUGE to me because there were definitely much more well-known scrappers who didn’t make it through. I ended up being eliminated after the 2nd round but even so, the boost of confidence I received from competing made me so glad I’d stepped outside of my comfort zone to give it a shot. But as cliché as it sounds, these competitions are really not just about winning for me. Every time I participate in a scrapbooking competition, I learn something new about my scrapbooking, my design style and myself. Much like the Digi Dares, scrapbooking competitions push me creatively and I always come away with some of my most favorite layouts because I’ve pushed myself to do something beyond what I normally do. I’ve always been a big believer in the idea that if you’re only doing what everyone else is doing, you’re just another face in the crowd. This is true in competitions, CTs, life, you name it. You have to be willing to push yourself and try new and different things if you ever want to grow – as both a scrapbooker and in life. I have no doubt that every scrapbook competition I’ve participated in has helped me become the scrapbooker I am today. When I showed this layout to Adam earlier this week, his comment was, “It looks like you used a baby kit for a non-baby layout.” Which let’s face it, isexactly what I did. As any scrapbooker who’s ever been on a Creative Team knows, there are times when you have to do your best to rock a kit that maybe doesn’t fit 100% with with who you are or how you scrap. Being a child-free scrapbooker I think I run into this more than most and normally I love the challenge of how can I make this baby/pregnancy/toddler-esque kit work for me? In the case of this specific layout, it just didn’t work. To be fair, it’s not the kit’s fault. It’s a cute kit! But I tried to fight the spirit of the kit and well, lost, haha. When I started scrapbooking in 2006, I don’t think I realized just how intertwined scrapbooking and my life as an Army wife would become. Scrapbooking has definitely become an outlet for me to deal with all the stress that comes with being a military wife – multiple deployments, moves, etc. It’s allowed me to keep perspective in the tough times and to remind myself to cherish the moments we have together when they are here. Because as every military spouse knows, there are times when those moments are few and far between. If you were to look through my albums today, I’d like to think you’d get a pretty realistic view of what it’s like to be a military wife in the 21st century. My struggles with careers, deployments, etc are all in there. When I look back at some of these layouts, I’ll admit, it’s tough. Sometimes I have momentary reservations where I think “holy crap, did I really put that out there?” But at the same time I embrace them for what they are. Because those emotions, those feelings, those moments – they are 100% REAL. They’re the story of a twenty-something Army wife trying to make sense of life and love through the art she loves. Having an outlet for dealing with a lot of these emotions has been so so beneficial for me. They represent scrap therapy at it’s best. Obviously no hits or misses list would be complete without including one of my dream CTs so pardon me while I gush a little, haha. 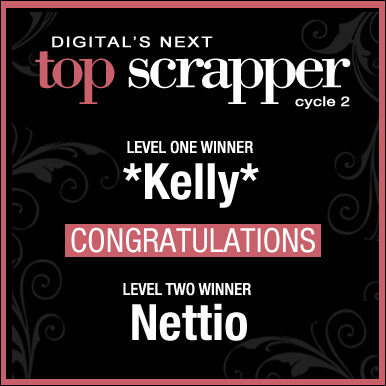 Like a lot of digital scrapbookers, becoming a Sweet Shoppe SugarBabe was a dream creative team of mine so back in October 2007, when I received my email from Robin saying I’d been selected, I was beyond ecstatic. So many amazingly talented scrapbookers have been Babes at some point that it still boggles my mind that I am lucky enough to be one of them. I am truly thankful that Robin and the team took a chance on me back in the day and chose me represent them and their designs. To say being a Babe has influenced my design style in ways I never expected would be an understatement. But being a Babe is so much more than just amazing scrapbooking products. I feel so blessed to be able to be part of one of the truly sweetest teams out there. The Sweet Shoppe community is amazing and I have no doubt that one of the reasons I’ve made it through 5 years of scrapbooking has to do with all of the amazing people I have met thanks to my sweet digi home. Being a Babe is truly the sweetest digi gig out there. As I’m sure I’ve mentioned before, unlike a lot of digital scrapbookers, I didn’t come from a paper scrapbooking background. I knew very little about scrapbooking when I started which was both good and bad. Good in that I wasn’t bogged down by any preconceived notions (like being “caught up”). Bad in that I really think too much about how a paper scrapbooking layout was put together. I honestly have NO idea what I was thinking when the placed journaling on top of those papers and arrow. It makes absolutely no sense. Did I hope the journaling would magically fade into the background? Even more perplexing is this would have been an easy fix. Add a little journaling block or journaling strip tucked in behind the papers with the arrow on top and voila! No more homeless journaling. But nope, I chose to leave it as is in all it’s floating glory. What makes this page even more cringe-worthy for me is this was the very first page I did as a Sweet Shoppe SugarBabe. Looking at it now makes me seriously question how I managed to ever get on the team way back when. Perhaps my reasoning for this design miss should be not guilty based on reason of temporary insanity due to newfound Babe-ness? LOL! Over the last five years, every one of these hits and misses have played a part in developing a style that I love. A style that is true to my love of scrapping small moments with clean, linear designs. Paper-centric scrapbooking with a bold, modern twist. My style has evolved in ways I never expected since I started scrapbooking in April 2006 and I can only imagine what the next five years will bring. But seeing the difference between this layout and the first layouts I created makes me so proud of how far I’ve come over the last five years. It’s been an amazing adventure and I am so excited to see what happens next. So what about you? 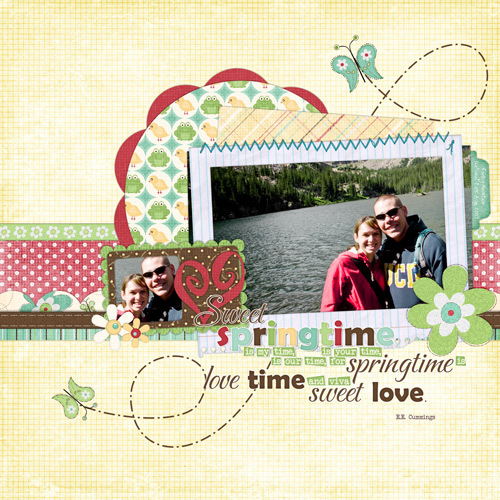 What are your scrapbooking hits and misses? Have any cringe-worthy moments you’d like to get off your chest? Any layouts you’re especially proud of? Share them with me in the comments! The date is April 7th, 2006. Adam and I have been living in Seoul, South Korea for just under four months. Not only was this our first military duty station, but I was also a brand new Army wife on her first ever even trip overseas. To say it had been a challenging few months would be an understatement. A few months earlier, during one of my many I’m-so-bored-I-want-to-cry trips to the magazine section at the PX (that’s an on-base Wal-Mart-esque store for you non-military peeps), I had stumbled across a special issue of Simple Scrapbooks magazine featuring digital scrapbooking. “You mean I can use a computer for scrapbooking?” I thought at the time. I’m pretty sure a heavenly chorus of angels started singing “Hallelujah right then and there. 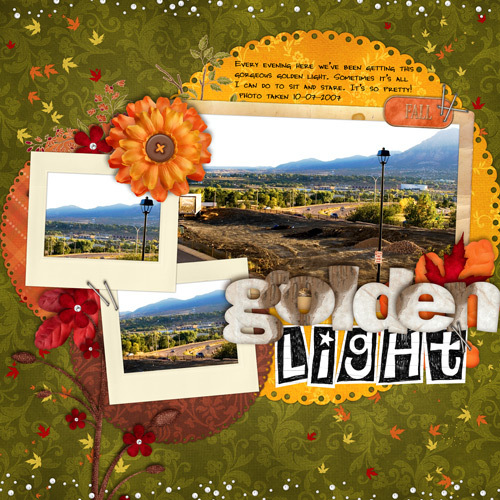 The next several months were a flurry of activity as I tried to learn anything and everything I could about digital scrapbooking. Many a day were spent browsing the galleries and forums at places like The Digi Chick, Scrapbook-bytes and Two Peas soaking it all in. Watching as many lynda.com video tutorials as possible in an effort to learn Photoshop as well as I knew InDesign, because I knew having a solid foundation in Photoshop would make everything that much easier when I was ready to get started. April 7th, 2006 was much like any other day. Adam was hard at work at the military hospital on post and I was home alone once again, hanging out on our un-comfy military issued dorm-style couch in our 7th-story Korean apartment in the heart of Seoul. It might have seemed like a normal day, but in reality, this day was special. Because it was this day that scrap history was made. That’s right. 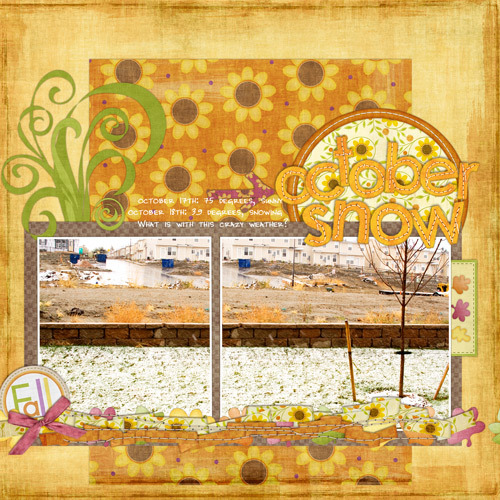 That is my very first digital scrapbooking layout. Take a photo now before it gets locked up in the vault for good, never to be seen again. Haha. When I look at this layout now, I see many mistakes. A photo in desperate need of some fill light. Some sketchy beveling in an effort to make the alpha look like a sticker. And the biggest crime of all – the use of the dreaded Papyrus font. To my knowledge I had never before nor ever again used that font. I have no idea what came over me that day. Temporary design insanity? I blame the Yellow Dust! 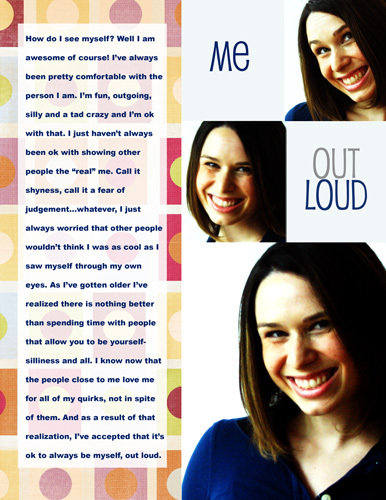 And yet at the same time, I can’t help but feel a bit of fondness toward this little first layout of mine. Sure it’s not a layout I would create today but when I look at it, I do see glimpses of the scrapbooker I have become. The paper blocking, the little wordstrips, a moment captured in time. Those are all elements I still love and use today. 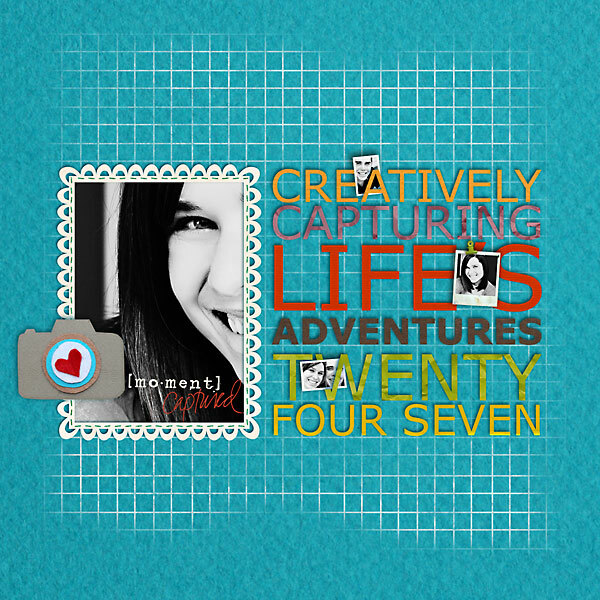 More than anything, this little layout represents the start of my digital scrapbooking adventure. An adventure that over the last five years has seen me through multiple military moves, two deployments and numerous other life experiences. I have met so many amazing people and have captured so many life moments that would have otherwise been forgotten. If you had asked me five years ago if I thought I would still be at this hobby today, I probably would have said no. But I am oh so glad that digital scrapbooking and the amazing community of people have become such an integral part of my life. I truly can’t imagine by life without it. Today, April 7, 2011, is officially my 5th Scrapiversary. That’s right. Today is exactly five years from when I created that first little layout of mine. And it’s time to celebrate. You can’t see me, but I am donning a party hat and throwing confetti in the air. Woohoo! Today begins the official 5th Scrapiversary celebration here at NettioDesigns. That means a slew of fun Scrapiversary themed posts as well as some awesome new products in the Shoppe. I am so excited! What about you? Anyone else ever celebrated a Scrapiversary? Were you excited to reach that milestone or did it make you wonder how in the world that many years slipped by in the blink of an eye? Any chance you were able to finagle a present out of it? I’ve been trying to convince Adam to buy me a gift (perhaps a camera upgrade?) but he doesn’t seem sold so far, haha.